after Vedanta and its Indian subsidiary, Sterlite, got the green signal to mine Niyamgiri for bauxite, Dongria Kondhs living in the hills have stepped up their vigil. They are determined to oppose any attempt at mining the hills. "The Supreme Court verdict has made these tribals apprehensive and tense. So far, no activity has been initiated in the area by Vedanta but you never know," remarked Jitu Jakesika, a Kondh who campaigns to preserve the hill's ecology. Anti-Vedanta demonstrations have been intensified in surrounding villages. "There will be more protests in the days to come," he adds. The company is not sitting idle either. Jakesika says the company recently sent its agents to win over the tribals by luring them. "Some people distributed clothes among villagers of Palberi, Kurakadu and Phuldumer on the hills. But the people have decided to make a bonfire of these clothes as a mark of protest," says Jakesika. Another tribal activist Sahdev Kadraka also alleges that about a week ago, some people came to his village Khajuri in a Bolero and tried to influence people in favour of Vedanta. 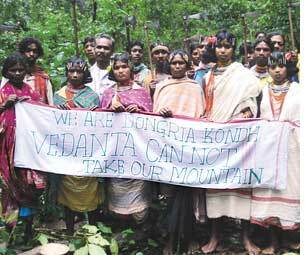 Activists campaigning against Vedanta's bid to mine the hills are chalking out strategies to support Dongria Kondhs. On August 18, activists of Niyamgiri Suraksha Parishad, Green Kalahandi and Kalahandi Sachetan Nagrik Manch met in Bhawanipatna, district headquarters of Kalahandi, to reiterate their resolve to intensify agitation against the proposed mining. Along with tribals from the hills, they plan to congregate in Bhubaneswar on September 10 for a public hearing, that will take cognizance of displacement issues from across the state. Later they plan to form a human chain at Lanjigarh--the site of Vedanta's alumina refinery plant. Vedanta sources say the company is ready with the mining plan: Bauxite ores will be extracted from the hilltop and will be brought to the plant site through a conveyor belt. As per the joint secretary, steel and mines department, Manoranjan Patnaik, the tripartite agreement between the government, the Orissa Mining Corporation (omc) and Sterlite Industries to form a special purpose vehicle (see 'Heavy metal', Down To Earth, August 16-31, 2008), is yet to be executed. The formality of Sterlite replacing Vedanta in the joint venture with omc remains incomplete. "No development can take place on the mining front unless the formalities are completed," Patnaik said. the Supreme Court verdict granting forest clearance for posco's proposed steel plant in Jagatsinghpur district has not dampened the fighting spirit of people in the project area. They are preparing to reinforce their claims to the forestlands by filing applications under the Forest Rights Act, 2006, before the government gives it away to posco. "The state government will de-categorise the forestland before handing it over to posco. This means, people who have been dwelling in these forest areas for generations can also assert their claims over it," says posco Pratirodh Sangram Samiti (ppss) leader Abhay Sahu. The area dominated by non-tribals and those staking claims on the forestland will fall in the category of Other Traditional Forest Dwellers. The process has already begun. People in Dhinkia and Gobindpur villages in Dhinkia panchayat have formed forest rights committees (frcs) and submitted their claims. Of 890 hectares (ha) of land from the panchayat that will go into the project, 769 ha is under the forest cover. Over 90 per cent claims are community claims, since people have been growing betel vines and cashew on vast tracts of the forestland in groups. The district collector of Jagatsinghpur, P K Meherda, said they are yet to receive any claim. "frcs will verify the claims and then forward their recommendations to us," he said. According to Meherda, of 1,620 ha of land required for the project, covering three panchayats, around 1,214 ha is under forest cover. Source say so far, the company has been allotted 207 ha of non-forest and non-encroached government land. Filing of forest rights claims is going slow at the moment; confusion reigns as people grapple with how they should file the claims. Villages are also divided into camps. But ppss is confident. It seems, the process of land acquisition will not be so easy after all.